A School of Pharmacy professor has been invited to deliver a web seminar as part of the National Nanosmedicine Seminar Series presented by Northeastern University. 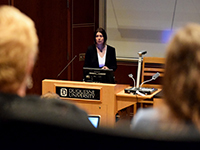 Dr. Jelena Janjic, an Associate Professor of Pharmaceutics, will speak on Pharmaceutical Development of Fluorous Nanocolloids for Inflammatory Diseases on Thursday, September 28, in Room 204 in the Bayer Learning Center. The seminar will be broadcast live to students in Puerto Rico, Alabama, Maryland and Florida. This Lecture series is organized by the Nanomedicine Academy at Northeastern, a National Science Foundation (NSF)-funded training and research program focused on nanotechnology applications to medicine. Janjic was personally invited to participate in the lecture series by Dr. Srinival Sridhar, Director of the Nanomedicine Academy, who said that students are eager to benefit from Janjic's insights resulting from her distinguished contributions to research on the topic of nanoparticles for imaging and therapy. Janjic holds a pharmacy degree from Belgrade University, S.R. Yugoslavia and a Ph.D. in Medicinal Chemistry/Pharmaceutical Sciences from University of Pittsburgh School of Pharmacy. She completed post-doctoral training at Scripps Florida in drug discovery and Carnegie Mellon University in imaging nanotechnology. She is full time faculty at Duquesne University Pharmacy School since 2009. Janjic is the Founder and has served as a Co-Director of Chronic Pain Research Consortium at Duquesne University, since 2011. CPRC, co-led with Dr. John A. Pollock, has generated more than $2.8 million in external funding. She pioneered nanotechnology development for chronic pain and holds the first NIH award to date focused on theranostic pain nanomedicine designed to simultaneously image and modulate immune cells for therapeutic intervention in a number of inflammatory diseases.